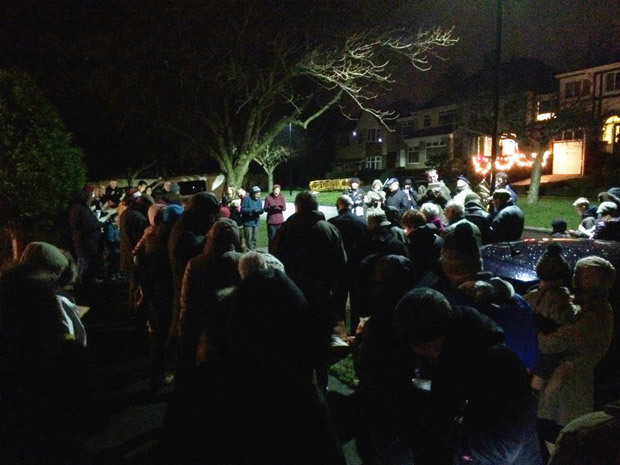 Residents of Dransfield Road celebrated the night before Christmas with carols on the street accompanied by brass musical instruments. It’s the third year running that people living on the road have got together on Christmas eve to sing carols, drink mulled wine and eat mince pies. Despite a couple of rain showers, over 60 people joined in. Happy Christmas to all in Crosspool and here’s to a good 2015 for our community. This entry was posted in arts, christmas, crosspool and tagged carols, christmas, dransfield road, good king wenceslas. Bookmark the permalink. Huge thanks to all the Dransfield road residents who donated food and money to the S6 foodbank at the carol singing tonight. Together we donated over 60kg of food!